GOLOVINKA, Russia -- The southern Russian steppe in summertime typically offers a soul-lifting panorama of wheat fields and sunflowers, swaying in the breezes, and vast empty spaces. It is Russia’s big sky country, rural and calm. Russian military vehicles in a field about six miles from the Ukranian border in August 2014. One morning this spring, the serenity in this village deep in the Russian countryside near the Ukrainian border was broken by a loud, rumbling explosion intense enough to send out window-shattering shock waves. The panicked soldiers were not under attack, as it turns out, but were fleeing a fire in a well-stocked ammunition depot at a nearby Russian military base, recalled a local dairy farmer who, worried about harassment, offered only his first name, Anatoli. By that point, he said, artillery shells had begun whistling away from the base and into the fields. The military said that a short-circuit in an armored vehicle started the fire. As a precaution, officials closed a major highway many miles away. Three villages, including this one, were evacuated. No one was killed, though six soldiers were injured and 30 military vehicles were destroyed. 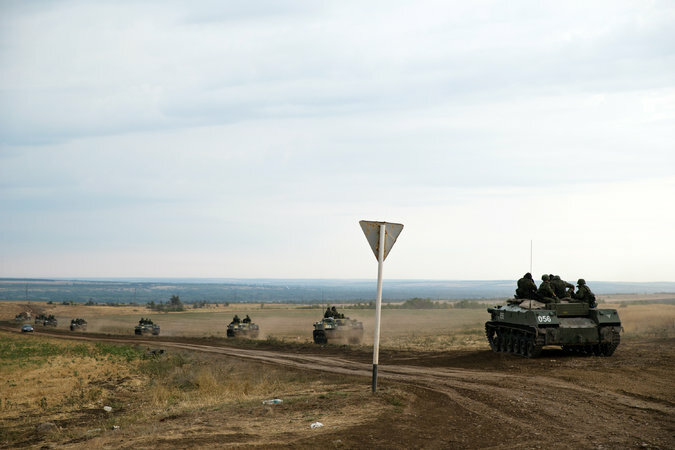 A year after the war started in southeastern Ukraine, the Russian military has largely abandoned efforts to disguise its activities along the border with Ukraine. The tiny village of Golovinka, an hour or so’s drive off the main highway on rutted dirt roads, has been transformed lately into a hive of military activity. The once-quiet military base nearby, Kuzminka, is teeming with soldiers and heavy weapons. Last year, the Russian Defense Ministry described the military buildup along the border as a military exercise, and it periodically announced pullbacks after exercises were completed. However, the large army presence, which cannot easily be disguised, seems now to have become permanent. Ukrainian and Western governments say Kuzminka is a staging ground for Russian soldiers and weapons headed into the war zone in southeastern Ukraine, where Kiev says 9,000 Russian soldiers are now stationed for a possible attack this summer on the city of Mariupol. The United States has released satellite images of self-propelled howitzers on one side of the border, and then on the other, and European monitors say they see nightly evidence of heavy weapons streaming into southeastern Ukraine from Russia. Why the Russian Army was stockpiling ammunition near the Ukrainian border was not a question the Kremlin or local commanders wished to address. Russia denies sending either men or weapons into Ukraine, claiming that any Russians there are private citizens volunteering to fight in the war. On this occasion, the army’s presence became so pronounced it could be seen from outer space. An enormous smoke plume rose over the steppe, according to a video posted online. Villagers piled children into cars and sped away. At the base, commanders ordered the thousands of soldiers garrisoned there to just run, saying, “We will find you later,” according to Viktoria Makarenko, a reporter with Novaya Gazeta who covered the blast. “They thought the whole thing would blow,” Ms. Makarenko said of the army’s decision not to try to keep the blast on April 28 a secret. In the steppe villages around here, known by their Cossack name stanitsy, residents are learning to live with the military presence, not to speak of the constant rumble of military convoys down side roads near the border. Arrests are up for drunkenness and fighting in the border villages. There have even been reports of rocket-propelled grenades fired in bars. Reported crime in the Rostov region adjacent to Ukraine’s separatist zones is up 24 percent this year, local news media has reported, in a sign of blowback inside Russia from the chaos next door. On a recent, sweltering afternoon here in Golovinka, a dozen or so soldiers tried their luck fishing in a pond, again wearing nothing but camouflage-print skivvies. Fishing for carp is one of the few opportunities for rest and relaxation out here. A few dragonflies buzzed about. Local residents say tens of thousands of soldiers are now garrisoned at Kuzminka, sleeping in tents. For the village, their presence has its upsides, too. A cluster of young soldiers, lithe and fit and shirtless in the summer afternoon, loitered beside a recently opened grilled chicken shack called Brotherly. The owner, Vladimir, who would not give his last name owing to the sensitivity of discussing the soldiers in the village, said he opened a month ago and attributed his success selling rotisserie broiled birds marinated in mayonnaise and paprika to the first rule of real estate: location, location, location. Brotherly opened beside the path through the fields that soldiers traverse to reach the village. In just a few minutes on a recent visit, a dozen or so soldiers with Mongolian features typical of some Siberian ethnic groups walked past. Soldiers with Mongolian features have also been seen fighting on the rebel side in eastern Ukraine. In typical times, few, if any, Mongolians are seen on either side of this border. The border, until last summer patrolled by Ukrainian border guards, is porous, not only allowing Russian military convoys to cross without interference, but opening the way to large-scale smuggling of coal, weapons and stolen cars. As many as a dozen coal trucks cross the border here a day, said Paul Picard, a French diplomat who heads the Organization for Security and Cooperation in Europe’s monitoring mission in the area. The Russian border police once caught someone trying to run more than 100 head of cattle across the border, local news media reported, after apparently smaller herds had gone unnoticed. A truck was stopped for trying to cross the border carrying 65 tons of salted pork fat, a staple throughout Ukraine and southern Russia. In one case this spring, a man accused of brawling argued in a court in Taganrog that he was innocent because he had “accidentally crossed the Russian border, hadn’t used bad language and was a militia member in the Donetsk People’s Republic,” a separatist enclave in southeastern Ukraine. In last year’s invasion of Crimea, Moscow deployed Russian soldiers whose only disguises were uniforms without identifying insignia. Similarly, Russian military activities along the border are ostensibly secret and yet obvious. The Russian policy of declaring the operations clandestine, whatever the actual level of secrecy or lack thereof, has proved effective, blunting the Western response and tangling up the prose of European diplomatic statements. On the ground, though, the gap between the propaganda and the reality is almost comical. Since counting began on Sept. 1 last year until June 1 this year, the European monitoring mission on the Russian side of the border has recorded 20,021 men in military uniforms crossing to and from rebel-controlled eastern Ukraine. That is an average of about 500 people who appear to be soldiers crossing the border per week. The men wear a variety of identifying patches, but not those of the Russian Army, or they have none at all. Mr. Picard said he had asked some of these men what they are doing. “They told us they cannot cross with weapons, but they receive weapons on the other side,” he said.